The nondestructive in-service-inspection (ISI) of the pressure vessel of German boiling water reactors (BWR) is done by ultrasonic testing from the outer surface and by remotely controlled visual inspection from inside. One of the goals of ISI is to verify the integrity of the walls of the reactor pressure vessel. According to the German KTA-rule 3201.4, the calibration of the ultrasonic equipment for testing the inner and outer surface is done at reference notches. In order to improve the ultrasonic-system's capability of detecting IGSCC-damage in the 8 mm thick austenitic cladding, seven surface breaking cracks were implanted in a test assembly. The different methods of crack implantation and their advantages and drawbacks are described. The test assembly contains 6 surface breaking thermal fatigue cracks with a depth of 4 mm in different orientations to the clad strips. Additionally, a 10 mm surface breaking crack was implanted that origins from a 50 x 50 mm craze cracking area with a depth of 1-2 mm. According to the German KTA-rules, notches are used to calibrate the ultrasonic techniques for the inner and outer surface. These kinds of reference reflectors have been used from the beginnings of ultrasonic testing, because they can be produced easily and in a reproducible way. It is also proven, that flaw detectors calibrated with these reference reflectors can detect a wide variety of surface defects in a material that may result from manufacture or operation. Concerns were discussed, that the use of notches for calibration and qualification of ultrasonic techniques might not be sufficient to detect defects in the cladding of the pressure vessel that were caused by intergranular stress corrosion cracking (IGSCC). A regulatory body demanded that cracks due to IGSCC or that acoustically represent IGSCC with a maximum depth of 4 mm in the cladding should be applied. The necessary conditions for IGSCC (sensitized material, corrosive medium and tension) are not fulfilled in the cladding of HEW's boiling water reactors. Nevertheless, measures have to be taken in order to show that the ultrasonic techniques used for the inspection of the cladding are suitable to detect surface breaking cracks. A reference reflector is a reflector in a test block whose response to the NDT technique provides a reference agains which other responses can be compared. A flaw deliberately inserted into a test assembly which is intended to produce a response to the NDT method under assessment which resembles that from a real flaw. Implantation of a crack, that comes either from a real component or was produced separately. The response to the ultrasound might be influenced by the grain structure or by the welding necessary for the implantation. According to the above definition, even the implantation of a real crack from a different component only will only lead to a realistic reflector. The depth of such a crack can only be measured by nondestructive testing and is therefore considered to be unsafe. Production of weld solidification cracks: These cracks are generated in an excavation which is filled with weld material. Due to the way of production the crack is completely surrounded by weld material. If the grain structure of the weld material is different to the original material, this might as well influence the response to the ultrasonic signal. It is also difficult to precisely describe the depth and shape of the crack. On the other hand, very narrow cracks can be produced that might be partially transmitted by ultrasound and therefore meet one of the typical characteristics of IGSCC. Generation of cracks by cyclic thermal and constant mechanical load: This kind of cracks has weld material only on one side and can be detected through original material from the other side. Therefore at least from one side no influences from the weld process are expected. The cracks have a coarse surface structure and can be produced reproducibly. The latter kind of production was chosen, because a very low influence of the weld material was expected. To produce such cracks, an excavation is made in the material. A tension bar is welded against one side of the excavation and a mechanical load is applied. The crack is generated in a heating and cooling process. After the tension bar is removed, both crack faces are pressed against each other and the excavation is filled by welding. In order to cover a wide variety of influences on crack detection, seven cracks were implanted in different locations in the cladding. 1 20 10 Perpendicular to the direction of the strip clads and between two strip clads. The crack is situated in the middle of a 50 x 50 mm area of 1-2 mm deep craze cracking. It is used to investigate the influence of the craze cracing on the corner trap. As mentioned before, the reactor pressure vessel of boiling water reactors is tested from the outside. The main ultrasonic techniques using shear waves with incident angles of 45° (1 MHz) and 60° (2 MHz). Both techniques are applied from opposing directions. The volume of the wall is also tested from one direction with tandem technique. The main testing technique for the inner surface is 45°-shear wave testing, but 60° shear waves and tandem technique are also evaluated. This gives some redundant information, because both techniques have shown good results in certain cases. Due to the reduced corner trap effect, the 60°-technique does not show high signal to noise ratios but this incident angle and the wide-spread sound field lead to characteristic patterns that are clearly visible in C-scans. It was the goal of the ultrasonic investigations to find out whether the realistic flaws were detectable and whether the standard sensitivity calibration with notches is suitable for detecting realistic flaws. The results of the ultrasonic tests are shown in colour-coded C-scans and in B or TD-scans. Fig. 1 gives a survey for the 45°-technique from both directions. It shows the results for the realistic reflectors ri1 to ri5. 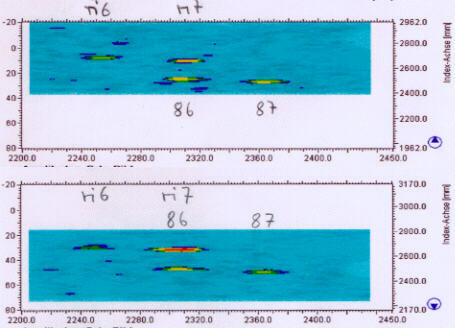 With the exception of ri1, each reflector has an amplitude that is at least above the registration level (yellow). Ri1 is below that level from one side, but has an amplitude beyond acceptability (red) when insonified from the other side. It is a well known phenomenon, that the echo height of reflectors perpendicular to the direction of the clad strips in the cladding is depending on the direction of the sound incidence relative to the direction of the weld propagation. This can also be seen at the notches 88, 51 and 54. The cracks ri6 and ri7 are oriented parallel to the direction of cladding. They are shown for both directions of the 45°-technique in Fig. 2. At least from one side they are above the registration level. Crack ri7 is above the acceptance level. If reflectors are oriented parallel to the direction of weld propagation, no specific dependence of the echo amplitude and the direction of the sound incident is to be expected. When reflectors ri6 and ri7 are compared, no dependence of the direction of incidence can be seen. Therefore, the excavation which has been filled with weld material has no influence on the echo height. It can also be deducted from this that the direction dependancy of the amplitude of cracks ri1 to ri5 is due to the influence of the cladding and is not a result of the implant process. When the results are displayed in TD-scans, further analysis is possible (Fig. 3). Both directions of incidence of the 45°-technique are compared for notch 88 and crack ri3. Both reflectors are situated in the middle of a clad strip and are oriented perpendicular to the direction of weld propagation. The notch 88 has a depth of 3.5 mm and is therefore suitable for this comparison. Both reflectors show a dynamic range of 20 to 30 mm and are clearly visible from the background of the cladding. The length of the crack indication in both directions is longer than the indication of the notch. In the TD-scans there is no dependence between direction of incidence and amplitude or length of the reflectors. This underlines that the excavation has no influence on the usability of the cracks. The slightly greater length of the crack indication might be cause by the difference in depth or by the coarse flaw face. This face which is typical for this kind of realistic flaws and is also known from IGSCC might lead to stronger reflections and greater length of indication. might lead to an even better detectability of defects. The notches and the realistic reflectors in the cladding were tested with a phased array transducer (1.5 MHz). The tranducers were calibrated for angles of incidence varying from 35° to 60°. From these data the maximum amplitudes and the signal-to-noise-ratio were evaluated. Typical results for cracks ri1 and ri3 can be seen in Fig. 4. The signal-to-noise-ratio is clearly depending on the direction of sound incidence. This effect can be seen when the direction of sound incidence is parallel to the clad strips. If the direction of sound incidence is with the welding direction (direction 2), the signal-to-noise-ratio lies between 10 and 16 dB and is slightly improving with increasing incident angle. In the other direction (dir.4), against the welding direction, it decreases down to values of 2 to 4 dB with the amplitudes below the registration level. In general, the amplitudes of these two cracks increase with increasing incident angle, while the signal-to-noise-ratio is direction dependent and tends to decrease with the incident angle increasing. The results of the phased array transducers are compared to the ones of a conventional 45°-transducer. The signal-to-noise-ratio of the 45°-transducers is less direction dependent and the signal amplitudes are higher than the ones of the phased array transducer. At an incident angle of 60°, the phased array transducer delivers high signal amplitudes and a good signal-to-noise-ratio when the incident direction is with the direction of weld propagation. This underlines that 60°-shear waves can be used supplementary to the 45°-shear waves. 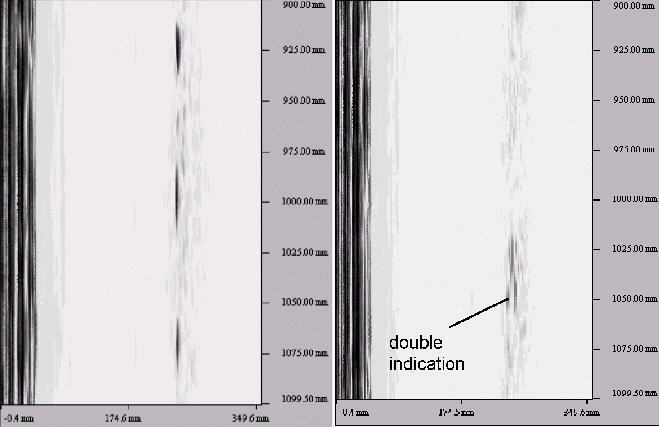 From the wide range of amplitudes only from the example of these two cracks it becomes clear, that a measurement or an estimation of the crack depth of cracks in the cladding only from the amplitude is not possible. If cracks proceed into the base material, as the 10 mm deep crack ri4 does, the TD-scan offers a chance to judge the integrity of the cladding. Fig. 5 compares the TD-scans of 3 4 mm deep cracks with a TD-scan of crack ri4 which is 10 mm deep. 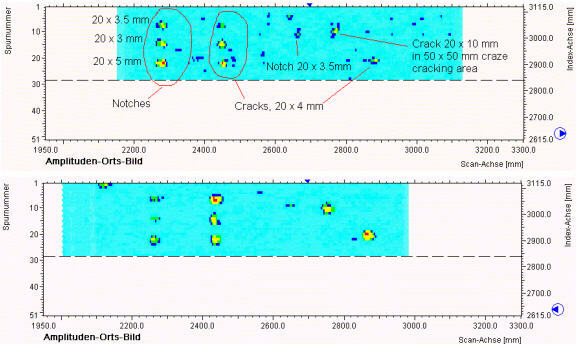 The scan of crack ri4 shows a pattern which significantly differs from the other cracks. The small echo parallel to the main crack response originates from the corner trap which is formed by the crack and the interface between cladding and base material. Visual examination of the cladding and the reactor pressure vessel internals is carried out supplementary to the ultrasonic testing. An immersed video camera is used, that is guided by a manipulator or a cable. It is the goal of the visual examination to detect defects at the components that may result from mechanical damage, corrosion and cracks. In order to achieve sufficient resolution, a full scale image of the test picture according to DIN 25435-T4 must consist of at least 400 lines. This requires CCD cameras with the S-VHS-system. The data of the online evaluation are recorded with a video recorder. For enhanced visual testing the detection of a 0.025-mm-platinum-wire on a white and black background and the detection of a mechanical fatigue crack are required. The craze cracking area in the surrounding of crack ri4 can also be used to demonstrate the performance of the visual examination. Fig. 6 shows an example for the enhanced visual examination in the craze cracking region. 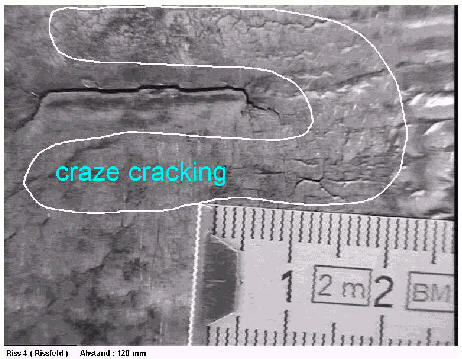 The craze cracking is clearly detectable, even for cracks with a length of about 5 mm. In order to improve the ultrasonic-system's capability of detecting IGSCC-damage, 7 surface breaking cracks were implanted in a test assembly. The different methods of crack implantation and their advantages and drawbacks are described. Ultrasonic tests were performed with standard techniques using conventional 45° and 60° shear wave transducers. The influences of the weld direction of the cladding and the crack implantation process are discussed and compared with reference notches. Additionally, a phased array transducer was tested and evaluated for incident angles varying from 35° - 60°. The effect of the incident angle on signal amplitude and signal-to-noise-ratio is discussed and compared to standard techniques. Compared to 45°-shear wave testing, other techniques do not offer significant improvements in signal amplitude nor in signal to noise ratio. The calibration with notches is suitable for detection of surface breaking cracks that have a response to the ultrasonic technique comparable to IGSCC. Surface breaking cracks with a depth of 4 mm in an 8 mm thick cladding can be detected with the testing technique used for the cladding of pressure vessels in boiling water reactors. A visual examination of the cladding was done with a CCD-camera. Short craze cracks with a length of about 5 mm could be clearly detected.